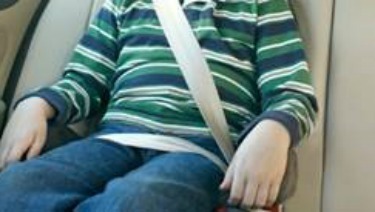 Parents of obese and overweight children often worry about how they can safely transport their children in car seats. Appropriate restraint use for tall and/or heavy children can be a challenge. To meet the needs of larger children, car seat manufacturers have developed many seats that fit children to higher weights and heights, including rear-facing and forward-facing seats and belt-positioning booster seats. Children 12 years and younger should ride in the back seat. Infants and toddlers should ride in rear-facing car seats as long as possible, until they reach the weight or height limit for rear-facing set by the manufacturer of their car safety seat. Those limits can be found in the instruction manual and on a label on the side of the seat. Toddlers and young children who have outgrown the rear-facing weight or height limit for their seats should ride in forward-facing car seats with harnesses as long as possible. School age children who have outgrown their car seats with harnesses should ride in booster seats until the adult seat belt fits properly, usually between 8 and 12 years of age. This means that the lap belt fits low across the upper thighs and the shoulder belt crosses the middle of the chest and shoulder. For more information on how to decide when your child is ready to move to the next type of car seat or into the adult seat belt, see our car seat guide. Never use a car seat if your child weighs more than the seat's weight limit or is taller than the height limit. Check the labels on the seat or manufacturer's instructions if you are unsure what the limits are. The "best" car seat is the one that fits your child, that fits your vehicle, and that you will use correctly for every trip. If you need help finding a car seat that fits your larger child, a Child Passenger Safety Technician may be able to help. You can find a Technician near you by visiting http://cert.safekids.org (Click on “Find a Tech”) or calling the toll-free 1-877-366-8154. For toddlers or young children whose behavior will not yet allow safe use of a booster seat but who are too large for a forward-facing seat with a harness, you can consider using a travel vest. A list of travel vests is available in our car seat guide. Most travel vests have upper weight limits of 60 to 168 pounds.